Shopping for Super Soaker Roleplay? Unleash huge soakination with the Super Soaker Floodinator water blaster! Fill the tank and pump to fire a deluge of water up to 38 feet (11.5 meters). The tank holds 70 fluid ounces (2 liters) of water, putting plenty of waterpower in the hands of battlers. 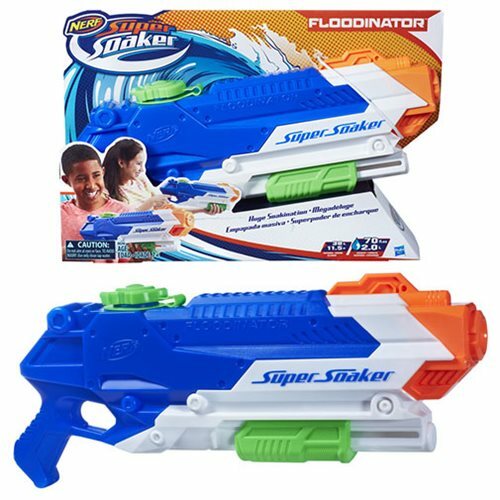 Grab the Floodinator water blaster and flood the competition! Nothing soaks like a Super Soaker water blaster! Ages 6 and up. CAUTION: Do not aim at eyes or face. TO AVOID INJURY: Use only clean water. Ages 7 and up.